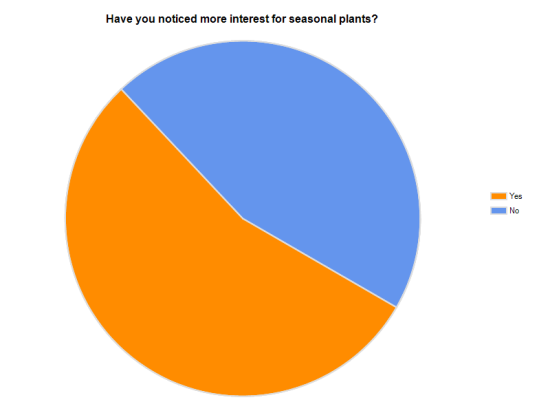 Survey Results: are your customers demanding British or seasonal produce? At the beginning of October we asked what your customers thought about British and seasonal. Lots of you took part in our short survey, so thank you! From the comments, it's clear that British and seasonal is something that many of you are passionate about, which is fantastic to see, as we do like to promote British and seasonal produce where possible (who remembers our Best of British event a few years ago?). Some very interesting comments came out and so we thought if you wanted to follow them up with us (and perhaps talk about supply/sourcing of British produce), come and chat to us at our Open Surgery which is taking place on the 8th November between 7am-10am on Flower Market Stand E4. But for now, time for the results, and don't forget to leave a comment below letting us know what you think of the results. Are they as you thought they would be? Have you noticed more interest for seasonal flowers? 91.9% of you answered yes. Just 8.1% said no. Have you noticed more interest for seasonal plants? Unlike for flowers, this was split down the middle with 54.7% saying yes and 45.3% saying no. Have you noticed more demand for UK grown flowers? The majority said yes, 73.3% of you, and 26.7% said no. Have you noticed more demand for UK grown plants? Again, very different to flowers with over half, 58.1%, saying no and 41.9% yes. Do your customers care where your flowers/plants come from? Over two thirds answered yes, 69.8%, and 30.2% said no. Let us know your thoughts in the comments below. Are these results what you expected?